There’s just one version of this light, but it’s available in two body colors: black (seen here) and gray. The TUP is available at nitecorestore.com for $65. This is a fun little light, but it’s too big for my (and probably most) keychain(s). 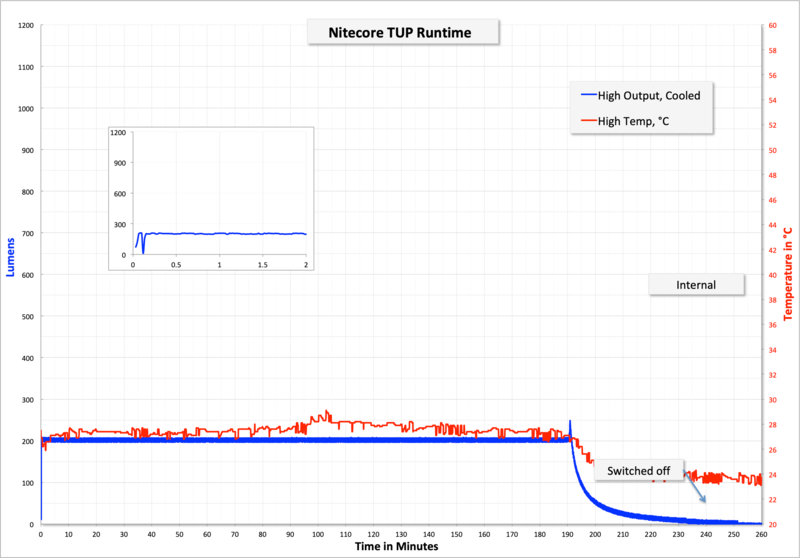 The output is good, and lack of thermal protection means Turbo can be restarted over and over again, which is an interesting…. feature (feature might not be the right word.) I also do like that it’s not round – its shape keep it from rolling everywhere. The package is a toned-down version of the Concept series packaging. It’s a box like the old style, but with the (subtler) printing and coloring of the new style. Included was this quick start guide, which was actually helpful, since the light ships in Demo mode. Here’s a pdf manual for the TUP. And one final part of the packaging: the OLED has a protective cover, which should be removed. 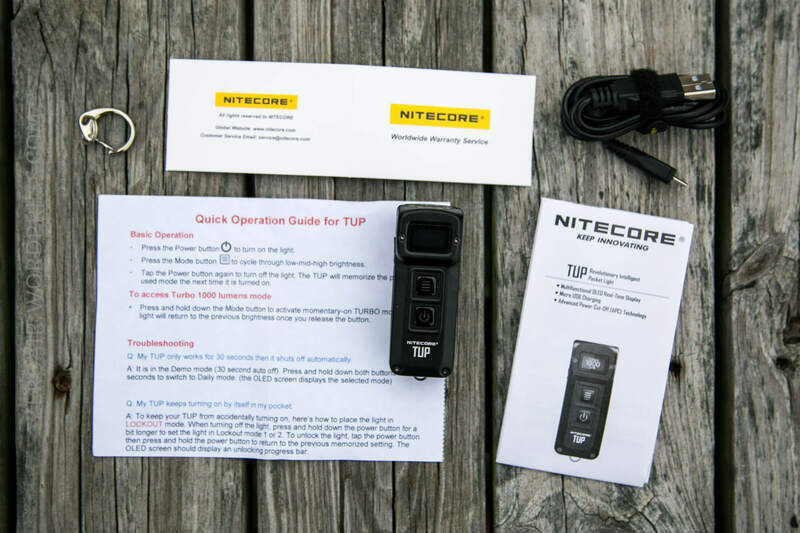 The TUP feels in hand just about like most of the other Nitecore dual switch keychain lights. Some form of higher quality seam between the two metal body halves could probably help this to feel like a higher quality light. It certainly has an interesting look, though! 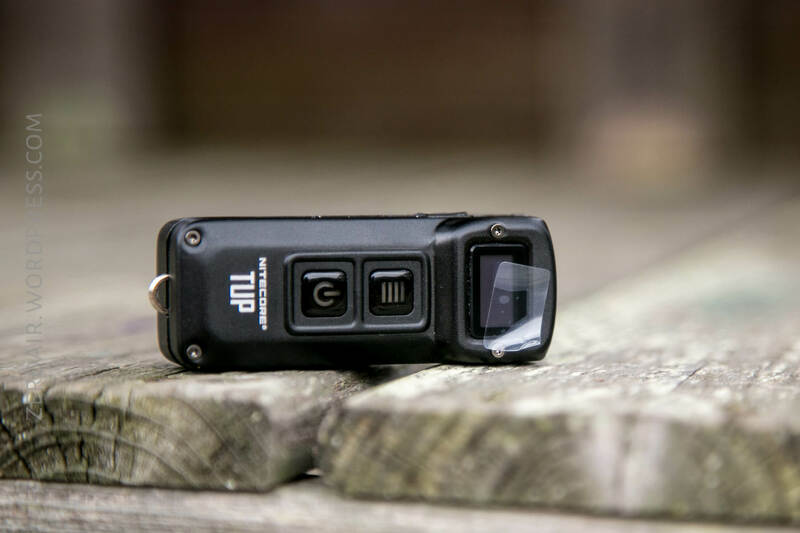 This beefy pocket clip is the main way to carry the light. It’s attached by two Philips screws. It has a reasonable mouth, and is deep carry, which is nice. It’s exactly opposite the switches, so using the electronic lockout is an absolute must. The clip is removable and when removed, leaves a very symmetrical light. Another option for carry is the metal loop on the tail of the light. The metal clip, which is included, can attach here. 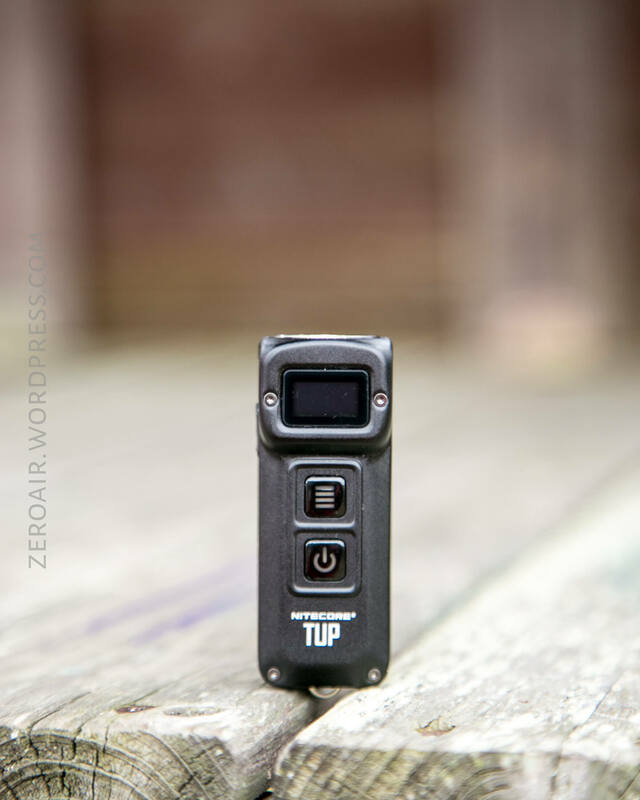 The TUP is powered by an internal pouch battery. 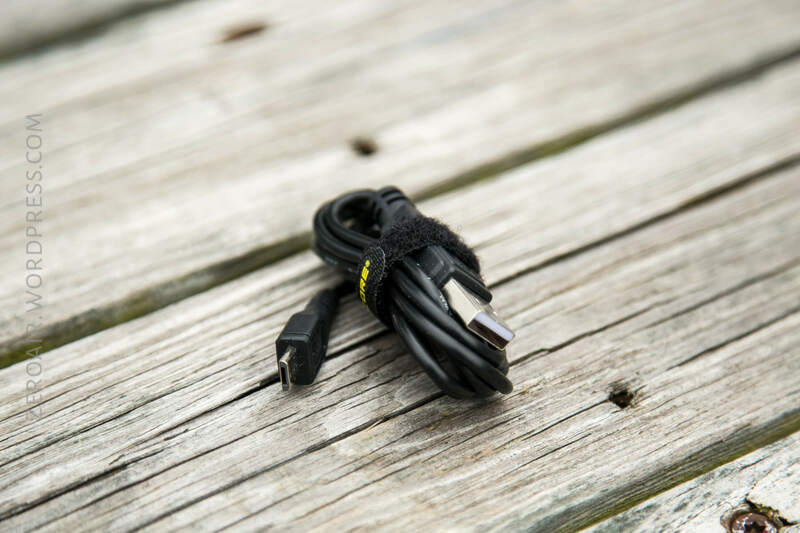 It has on-board charging via micro-USB (and a cable is included). 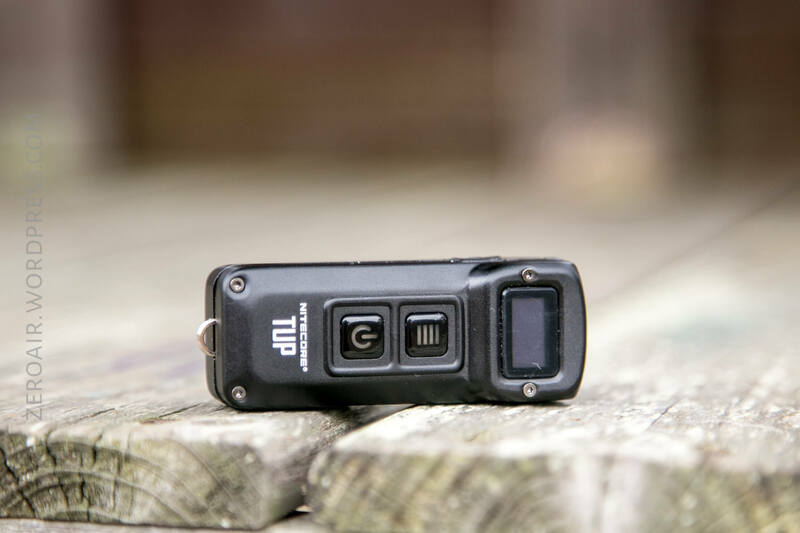 The OLED display can be made to show the voltage of the battery when the light is off – just click the mode button. 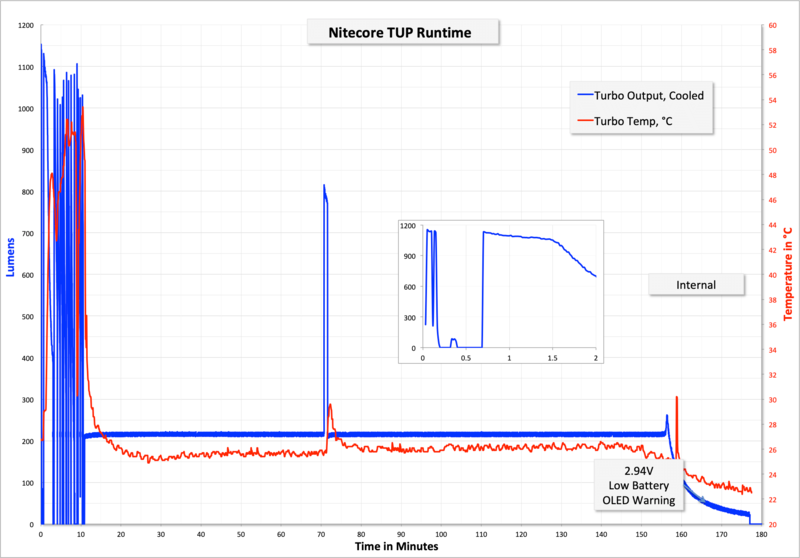 There’s not a “constant Turbo” mode, so for my Turbo test, I just held Turbo until the output dropped to a few hundred lumens, and then hit Turbo again. That’s a bit of a confusing test probably, but doing it any other way didn’t make a ton of sense. 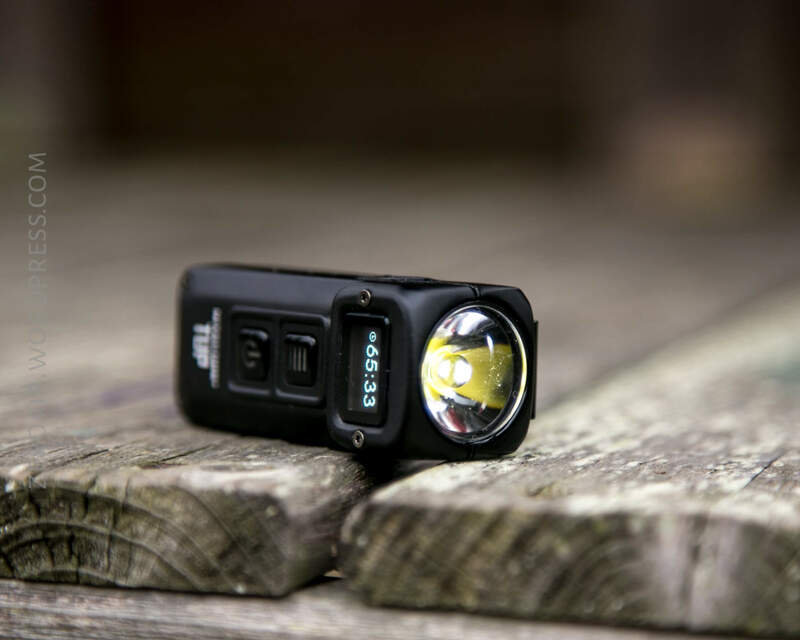 What’s notable about this test is that just for the initial 10 minutes, the Turbo output stays over 1000 lumens! 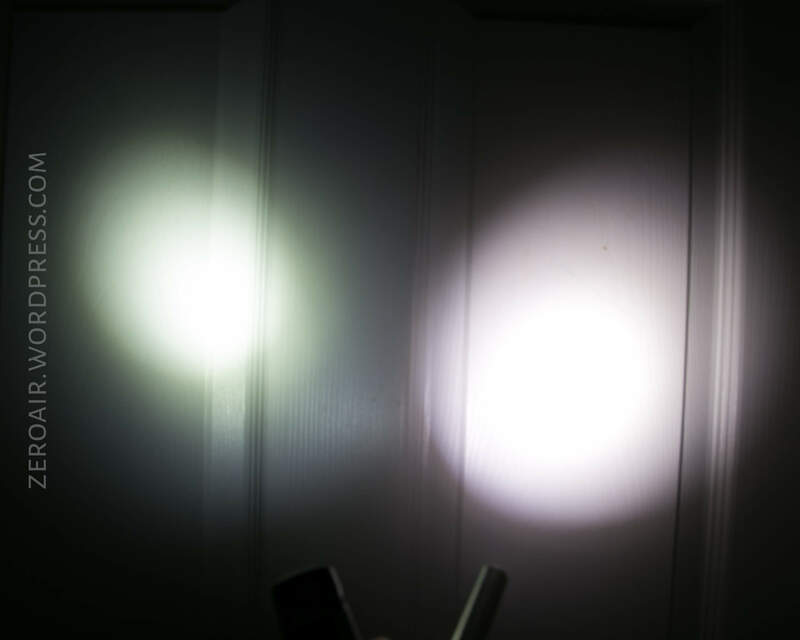 Once I let the light switch to high, then hit Turbo again (70 minutes), the output had dipped to around 800 lumens. While I don’t like this interface (let me leave the light on Turbo! ), the output is fairly respectable. Also noteworth is the temperature – after repeated Turbos, the light was around 54 degrees C. That’s not insignificant. The light was giving a low voltage warning through the OLED when I stopped the test. High looks about the same as Turbo, except in this case I ran the light until it fully shut off on its own. The temp on this mode is a non-factor. 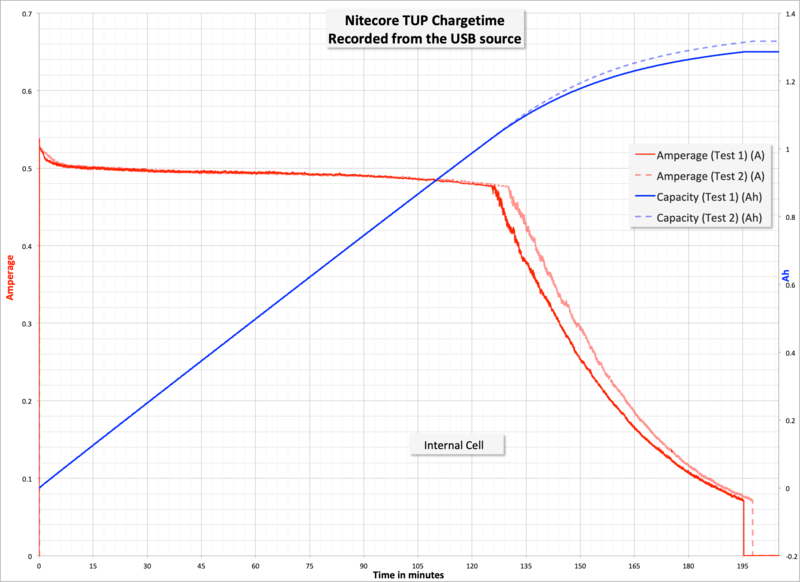 Nitecore includes a nice USB to micro-USB charge cable. Charging proceeds at around 0.5A, which is probably a good C for this small pouch cell. There are two buttons for the TUP interface. 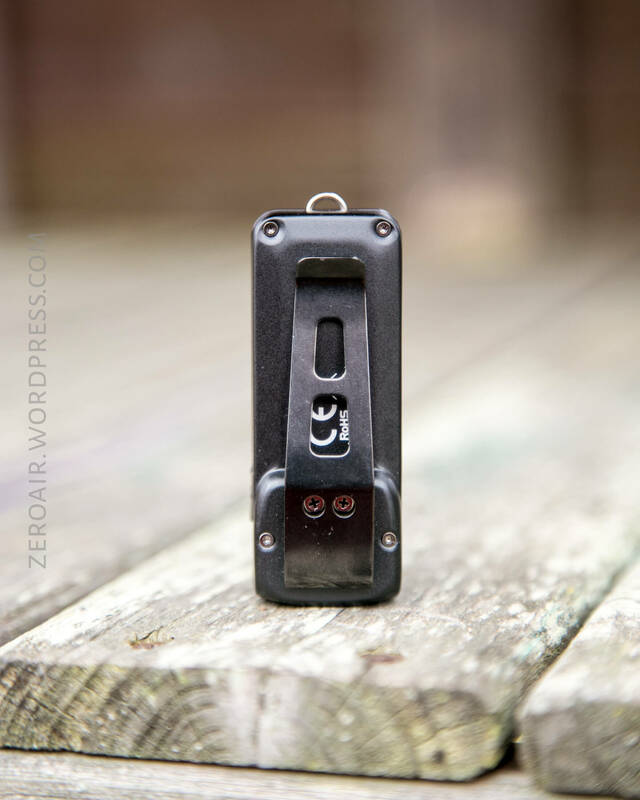 The buttons look just like the other keychain lights from Nitecore, but I believe the UI is different. They’re e-switches, and have blue indication behind them. There’s more to the UI than all that, though. There are two “User Modes” – Demo and Daily. To switch between the two, hold both buttons simultaneously. And a note about the Lockouts. 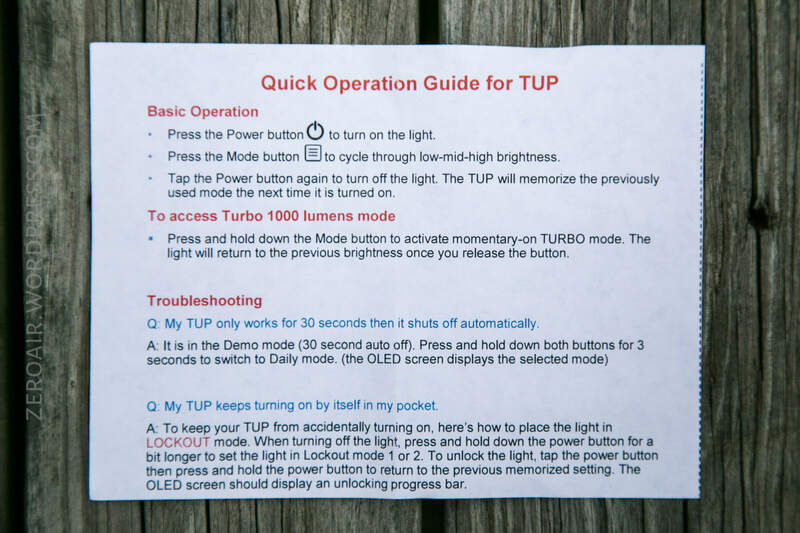 Lockout 1 allows access to Turbo, but in Lockout 2 the light is completely unusable. The emitter is a Cree XP-L HD V6. That emitter is under an optic with a flat front (not indented or open like some TIR’s). The beam profile is a great TIR profile – not much spill with a fairly even hotspot. The tint could be better. Twice in a row now I’ve said that nothing really compares to a review light but it’s true again here. The TUP is in a class of it’s own. It’s too big for a keychain light, and probably wouldn’t be chosen as a regular pocket light. I do like the UI (probably better than other similar lights like the TINI). I just wish the TUP was a little thinner. This is going to be Nitecore week, I think. I have chargers and another Nitecore light to post, and I’m not sure what will happen later in the week! Stay tuned!